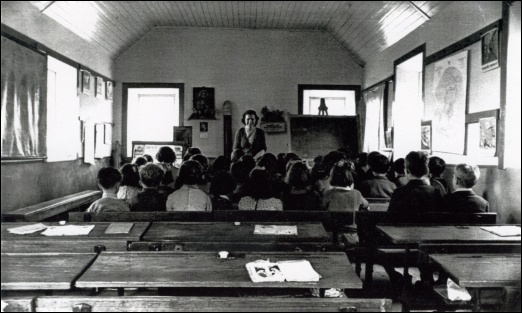 The initial application for a schoolhouse at Rathnageeragh states it was in the parish of Fenagh, the site was 1 rood, it was non vested, built by local funds in 1883 – a new house, one story high, slate roof, with four large windows, two on the front and two on the back, a door on the end, the condition of the house was judged to be excellent consisting of one schoolroom dimensions long 30foot, breadth 16ft, the condition of furniture was described as new and of good description 4 desks 9 ft long, forms 4 of them 10 ft in length each. The teacher Peter Doyle was qualified, the average daily attendance: males 16; females 14 Total 30; School hours 9 – 3; Religious Instruction from 3 p.m. – 3.15 p.m. Books used were belonging to the National board, 1st 2nd sequel and 3rd book Arrangement for admission of visitors: admitted at any hour during school time Management of school was under Rev. Ml. Conroy P.P. Myshall. This application was received in the office of Ed. on the 22-3-1864. The following is an extract from the Inspectors Report at the time: “I have talked to some of the farmers that I met. They expressed anxiety to have the school taken into connection with the Board. The neighbourhood is mountainous, but at the time very populated, and the school is placed on a central position to suit the wants of the people living on the side of and among the mountains. I found some of the pupils present on the day of my visit, showed no evidence of being to a National school, and that the great majority had never been to any school. I therefore beg favourable to accommodate the application. Michael Healy Inspector of school dated 26-4-1864.” And so a schoolhouse was built and sanctioned and paid for by local funds at Rathnageeragh the precise date of opening as a school was 11th January 1864 and as a National School was 1st April 1864. 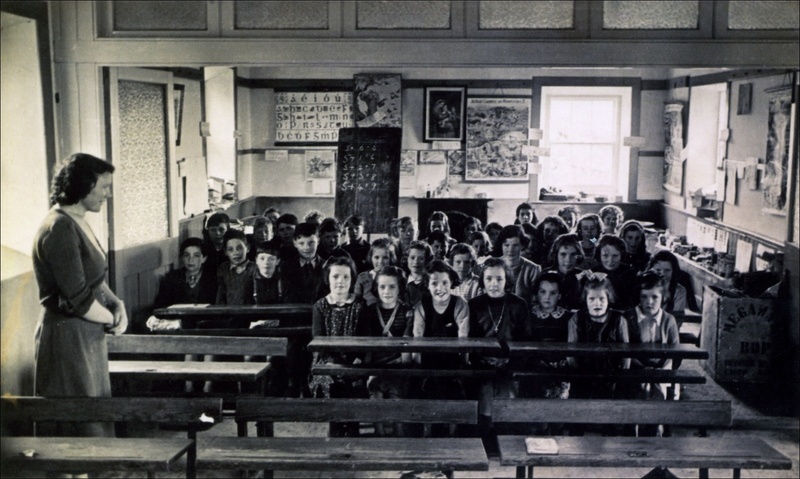 As the area was very populated the attendance to the school increased and a request for a female teacher, a work mistress with a knowledge of needlework and domestic organisation was made. The attendance increased from 30 in 1864 to 96 in 1868. The following is the Inspectors report to the National Board: “The parents in the neighbourhood frequently spoke to me about getting a work mistress to industrial instructions (needlework and domestic organisation) This could not be done till lately as no one qualified could be got. The appointment of a work mistress to my knowledge will increase the attendance of females that it will be necessary to provide an additional schoolroom and the manager is prepared to build. In a locality like this in among the mountains on the outskirts of Mount Leinster industrial instruction is most necessary and it will be vastly beneficial. I therefore beg to recommend that a salary be granted from the 1st February 1868 to the teacher, a work mistress and Junior literary Assistant. Michael Coyle District Inspector of National Schools”. Following this a female teacher with knowledge of industrial instruction and literary education was appointed - Catherine Kate Lawler a native of Barraderry, Kiltegan Co. Wicklow, stated to be of good character and very competent by Rev. Ml. Conroy P.P. Myshall. She taught school at Rathnageeragh from 1868 to 1900. Catherine Lawler married the Principal Peter Doyle on 8th May 1870. This Peter Doyle, Principal of Rathnageeragh N.S. was born in 1844 to John and Bridget Doyle, Bealalaw. He taught classes in the Chapel in Drumphea which replaced the local hedge schools. Following completion of his training he was appointed principal of the newly built school at Rathnageeragh in March 1864. Here he taught until his retirement in 1904. Peter was a founder member of the South Carlow Primary Teachers Association in 1880 (now I.N.T.O.) which was declared an illegal organisation at the time. Patrick “Pat “ Doyle son of the above went to school at Rathnageera. His name appears on the roll of St. Francis Seminary, Mountbellew, Co. Galway 1st Sept. 1899 as a member of the De La Salle Class in training as preparing for Primary School Teaching. He qualified in 1904 and was recognised as principal 1/1/1905. He is also mentioned as Secretary of the Local Branch of the Gaelic League 1917. Pat Doyle taught school at Rathnageeragh as Principal without break until he retired 1945, then his wife Anastasia was recognised as principal until her retirement in 1966. Before becoming Mrs. Doyle Anastasia was a McDonald from Co. Kilkenny. Pat and Anastasia were married in 1931. Two of her pupils Sarah Jordan and Kathleen Doyle won the Agallamh Beirte at Feis Ceatharlach in 1928 and 1929. Two other pupils Andy Jordan and Mary Tracey came first in the same subject. In 1930 her pupils staged a drama mor in the Feis and were highly commended. Pat and Anastasia had two sons Peter and James. Anastasia had three sisters who were teachers and Pat who was known as “Pat the Master” had two sisters in religion teaching in England. 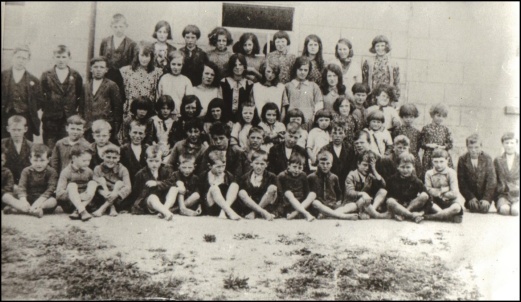 Rathnageeragh National School remained a two-teacher school until it closed its doors in 1967 when a new temporary school was opened in Drumphea.